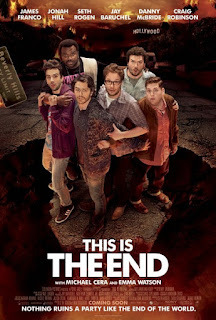 This is not a TMZ moment but is in fact the opening scene of This Is The End, Rogen’s shared directorial debut with co-writer and frequent collaborator Evan Goldberg and it is a telling one. 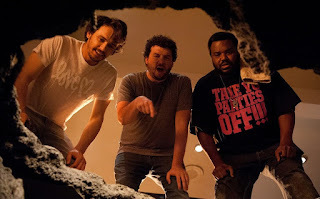 Comments like those have been directed at Rogen many times in the past and one has to wonder if this film, based on an unreleased short he made with Baruchel, isn’t his response since it allows him and many of his actor pals from Judd Apatow’s comedy stable to spend $30 million dollars playing themselves. But the inclusion of those throwaway lines hint at the self-awareness that makes the project so much more fun than the ego trip it could have been, as Rogen and Goldberg deliver the purest and funniest example of self-parody since Bruce Campbell’s My Name Is Bruce. 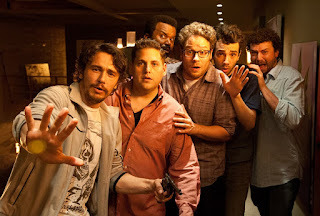 The self-reflexive plot has Baruchel, as himself, visiting Rogen in L.A. to hang out, only to be dragged reluctantly to a party at James Franco’s newly constructed (and self-designed) mansion, which is filled with their celebrity friends, including Jonah Hill, Danny McBride and Craig Robinson. The festivities are interrupted by an unexplained cataclysm as Hollywood starts exploding and people are pulled into the air by beams of light. 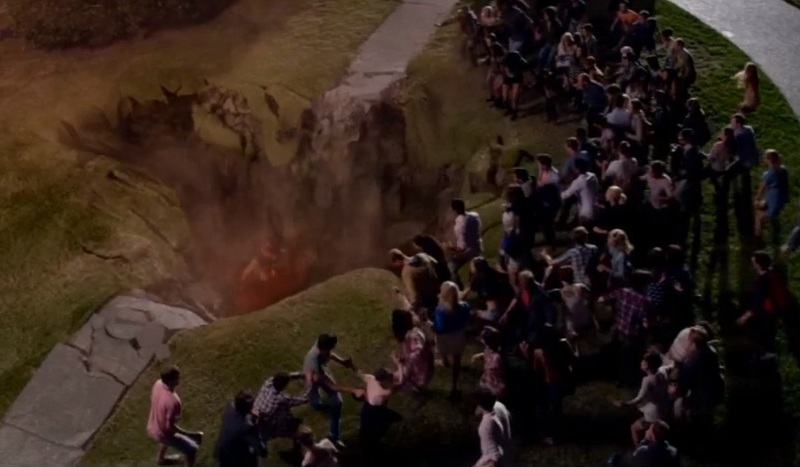 Before long, most of the famous party guests have been pulled down into yawning chasms in the Earth and the six leads are barricaded in Franco’s house bickering about what to do, what's happening, how they'll divide their supplies, and how soon before they’ll be rescued. Movies and books about doomsday scenarios often gets me to imagining how famous people would cope in those situations, an idea touched upon a bit in novels like World War Z and The Stand. As Rogen and Goldberg depict it, not very well. They ingeniously take cues from the structure and character beats of disaster movies to skewer both the self-importance and perfidy of Hollywood. Most movies about people thrown together in such a crisis have recognizable types: the voice of reason, the character in denial about what’s happened, the self-serving character who will sell out everyone to stay alive; here we get to see celebrities we know (or thought we knew) plugged into those roles. Where it can often be a detriment when an actor brings their baggage, from both on- and off-screen, into a film role, here it becomes a plus and is actually key to appreciating a lot of the self-referential humor. A great example is Baruchel, who essentially serves as the straight-man and audience-identification character. Much of the story involves how uncomfortable he is being forced to hang around Rogen’s marquee name pals, a sly acknowledgment of the fact that of the main cast, Baruchel thus far hasn’t had the break-out success of the others, all of whom look to be having a blast playing nightmarish, bizarro versions of themselves. Rogen plays up his reputation as a goofy stoner. Franco, known for his interest in art and his reputation as a prankster, is transformed into a self-absorbed, pretentious ‘artist.’ Hill becomes a sensitive sycophant, Robinson a hard-partying coward, McBride a sleazy, dim-witted oaf and so forth. The screenplay also toys with public perceptions of celebrity life. Everyone assumes that co-stars must be close friends and hang out in real life, so the film plays with that idea and then twists it by revealing that beneath the feigned camaraderie, most of these people can't stand each other. Amazingly, as cynical as the film may be, it doesn't come across as really mean-spirited, probably because few of the film's barbs are directed at anyone not participating in the joke. Among those playing along are former Hogwarts alum Emma Watson, making an adorable but all-too brief appearance, and Michael Cera, who's received much of the same criticism as Rogen for playing the same awkward hipster character in every movie, gleefully violating audience expectations with his sleazy onscreen behavior. We also get a host of cameos, references and in-jokes, to the point that anytime another character appears our first question is what notable person it’s going to turn out to be. Happily these moments are well spread out throughout the film, with the best cameo coming late in the third act and leading to one of its biggest laughs. True to the working methods of the cast, a lot of the film's dialogue has an improvised feel but only a few moments, such as some repetitive bits of bickering between Franco and McBride, feeling drawn out. Years of working together have given them all a great rapport and I imagine trying to edit their antics into a 100-minute film couldn't have been easy. In particular, the friendship between Baruchel and Rogen, forming the core of the story as it does, comes off as genuine despite the irreverent tone to everything around them. 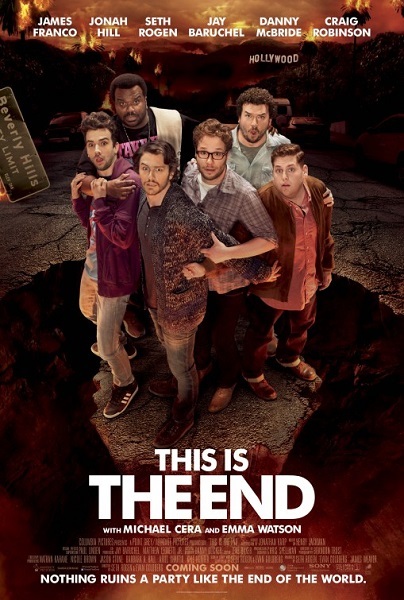 I won't spoil the nature of the big disastrous event occurring in the film except to say that Rogen and Goldberg don't shy away from the larger aspects of it and play it right out to its end, inventively using it to comment on the self-serving nature of our thespian heroes. The special effects depicting the destruction aren't the most polished but given the small budget and the focus of the movie on other things, that's hardly much of a problem. Proving that playing themselves can be immensely entertaining, I hope the gang has at least earned a respite from criticism regarding any perceived lack of range. Some actors know what their strengths are and play to them, but it turns out emphasizing their personality flaws, exaggerated or not, can be just as rewarding. Reveling in the most detestable aspects of their ersatz selves has produced some of Rogen and company's best comedic work to date. Now, comes the real question: when can we expect Pineapple Express 2? Great review Tim. Had a great time with this movie because it’s goofy, fun, wild, unpredictable, and above all: hilarious. This movie could easily have gone terribly wrong but it might be the funniest thing I've seen so far this year. I certainly won't look at Franco quite the same way again. Daryl wants me to see it and I was against it. I may actually go now that I read your review. Well, some of your appreciation may depend on how much you like these guys' work in their other movies. I enjoy most of it so that definitely helps.